LAWCHA 2017-18 Newsletter Now Available! Our 2017-2018 newsletter is now available. It is in the mail if you are a LAWCHA member, or if you prefer, you can download it on our newsletters page. It’s that time of the year again, LAWCHA members! Have you remembered to renew your membership? The Scales of Struggle conference featured the largest program of any LAWCHA conference to date features nearly 100 panels, workshops, films, and performances, along with five plenary sessions, stretched across four days. Official registration topped 460 with another 100-150 attending the free evening sessions. 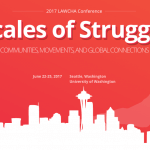 At the 2017 LAWCHA Conference in Seattle, a world-class panel of experts discussed the affects of mass incarceration on the working class. Featured in the talks are Heather Ann Thompson, Kelly Lytle Hernandez, and Chelsea Nelson. Upcoming LAWCHA president Julie Greene presides over the session. Congratulations to our 2017 prize and award winners, announced formally at the 2017 Annual LAWCHA Conference in Seattle, Washington. The Labor and Working-Class History Association (LAWCHA) strongly opposes the nomination of Andrew Puzder for the position of Secretary of Labor. We believe he is not qualified to occupy this position and indeed, would pose a profound threat to workers.